Wish your houseplants were a bit more mobile? Check out this cyborg plant that rolls itself around on two wheels. 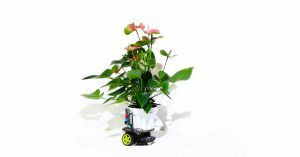 On Thursday, researchers from the MIT Media Lab unveiled Elowan, a hybrid between a plant and a robot. Thanks to a system of electrodes and a robotic base with wheels, Elowan can detect light sources — and then drive itself toward them, using the plant’s own electrochemical signals. Plants are sensitive to their environments. They can sense changes in light, gravity, temperature, and more. These changes prompt the organisms to send electrochemical signals between their tissues and organs. When Elowan senses light, it produces some of these signals. Electrodes connected to the plant’s stems and leaves detect the signals, and that triggers Elowan’s robotic base to drive in the direction of the light. We spend a lot of time thinking about how we might use tech to augment our human bodies, but according to Elowan’s creator, Sareen Harpreet, humans needn’t be the only cyborgs populating future society.